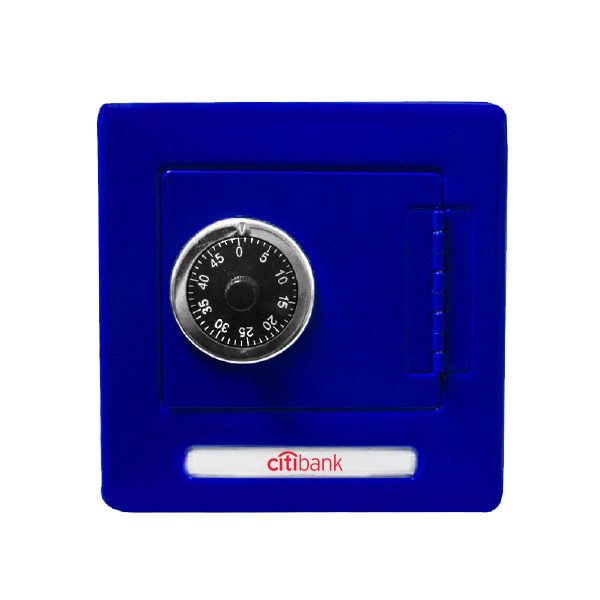 Blue Metal Combination Safe Bank: Square, Combination Lock, Swinging Door, Hinged Door, Saving, Change Holder, Top Slot, Coin Slot, Currency Compartment, Round Dial. Ideal for placing your valuables in. Made from metal which adds a high perceived value. Industry applications: Business services, financial institutions, and insurance services. 5.25 x 5.25 x 3.75 inches OR 13.34 x 13.34 x 9.53 cm. 18 x 14 x 14 pcs. 2.5 x 2 inches OR 6.35 x 5.08 cm.